My first exposure to the world of advertising came at a very young age. Our neighbor in Maunawili was a Dutch guy who worked for an agency, I think as a creative director. They always had cool stuff at their house, in retrospect perhaps because they had no kids and a great deal of pakalolo. Lots of artsy types, designer furniture and magazines. It was fun to hang out over there and I think they liked having me around for my childlike wonder or some such, which is funny because I was a freakishly intellectual little kid. Don't laugh, I think it wore off as I grew up. Why was this relevant? Well, fast-forward a couple of decades, to about this time last year when I was at eBay for their holiday campaign. The entire trip was a whirlwind of awesomeness but I was particularly thrilled to meet Dennis Goedegebuure, who is one of the few people I've ever encountered who can make analytics remotely interesting to me. We ran into each other again at EVO last summer and apparently like to give each other grief. So, yeah, he's a Dutch marketing guy and that's how my train of though works. Now you know, lucky ducks. Cute, right? Well, it gets even better. On Halloween, he will be wandering the streets of San Francisco dressed up in the golden glory of the Yellow Angry Bird Costume, with matching yellow ensemble underneath. I wish I could see that in person! 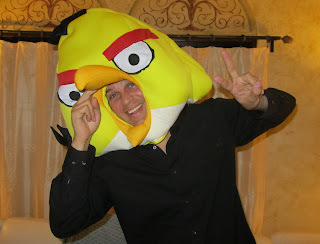 I kind of think the Black Angry Birds Costume would look great modified into a minidress. Although I'd be afraid someone would try to pick me up and throw me up into the air… Which Angry Birds character would you most likely dress up as? I have no doubt that those costumes are wildly popular this year, and who better to sport one than Dennis?!! Love it! My son is a huge fan of Angry Birds! My little ones aren't into this Angry Bird craze yet, but we see it EVERYWHERE! my kids are begging me to let them play and I have no idea what this is all about! I am so behind the times...but the costume is cool! I have resisted the Angry Bird craze, but I know it is very popular. I did see a cute t-shirt the other day for Happy Birds!